The time has come for our blog to be refreshed and improved so we have moved it over to our new look website. Any new material will be added to the new one and this old (but faithful) one will no longer be updated. It will still remain on Blogger while we transfer most of the old posts to our new blog. We have a passion for real food and local produce. We love cooking it and eating it and want to share the best that our country has to offer. We set up The Artisan Food Trail which is a unique and affordable online marketing service for artisan food and drink producers all over the British Isles. At The Artisan Food Trail we love to help small food producers by increasing awareness of their products to the consumer. We promote them, spread the word & build a community to help them. Signing up for our full colour, food packed email newsletter is a great way to keep up with what's going on, on The Artisan Food Trail. Are you a food or drink producer? Visit Artisan Food Trail's profile on Pinterest. 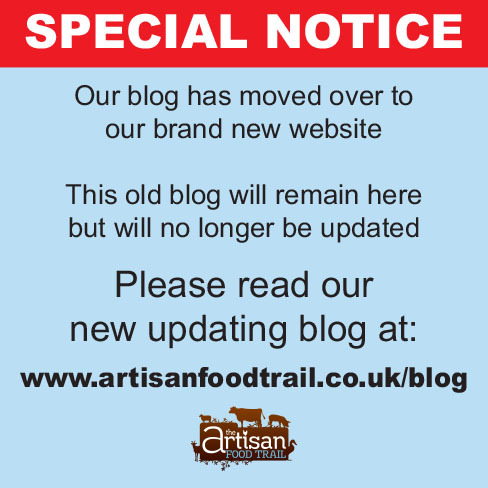 © The Artisan Food Trail / © childsdesign. Powered by Blogger.